The Council is pleased to announce that at its meeting in November, Councillor Mark Brown was elected as Deputy Mayor of Seaford. Councillor Brown is in his second term of office as a Town Councillor, having first joined in 2011. He served as Mayor of Seaford from January 2014 to May 2015, holding various events and raising over £2,400 each for his two chosen charities; Seahaven Storehouse and Waves Seaford. Councillor Brown will be supporting current Mayor, Councillor Lindsay Freeman, for the remainder of the Municipal Year until May 2017. 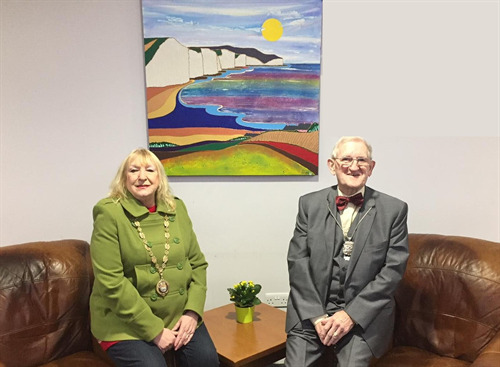 Mayor of Seaford, Councillor Lindsay Freeman, and new Deputy Mayor, Councillor Mark Brown, in the lounge at The View at Seaford Head.